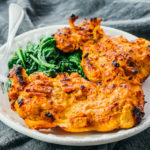 An easy oven recipe for Indian tandoori chicken marinated with greek yogurt and spices. Keto, low carb, and gluten free. Rub salt and pepper over all surfaces of the chicken thighs. Drizzle with lime juice, spreading it on all parts. In a large bowl, combine all marinade ingredients until well-mixed. Add chicken thighs one at a time, turning in the marinade until well-coated. Cover and refrigerate for 6 to 24 hours. Position a rack in the center of the oven. Turn the broiler setting on high. Prepare a broiler-safe pan and line with parchment paper or foil. Optionally, fit a wire rack on top of the pan and spray or brush with vegetable oil -- this allows the released juices to fall through. Shaking off any liquid and discarding leftover marinade, use tongs to transfer the chicken to the pan, spreading out each piece to lay them flat and arranging all pieces in a single layer. Broil until the chicken appears crisp and a bit blackened on top, with the marinade mostly dry and baked into the chicken, about 15 minutes. Flip the chicken pieces and repeat for the other side until the chicken is cooked through, another 10 to 15 minutes. Frequently monitor the chicken, as it can quickly burn. This recipe yields 5 g net carbs per serving (about 2 chicken thighs or 1/3 of recipe).